Happy spring, friends! Does anyone else feel like winter came and went in a flash this year? We soaked up as many crisp, cool days and as much of that soft white snow as possible over the last few months, and as soon as Punxsutawney Phil saw his shadow, we knew we didn't have much time to get in one last chilly weather adventure before that early spring crept in and the temps started climbing for good! 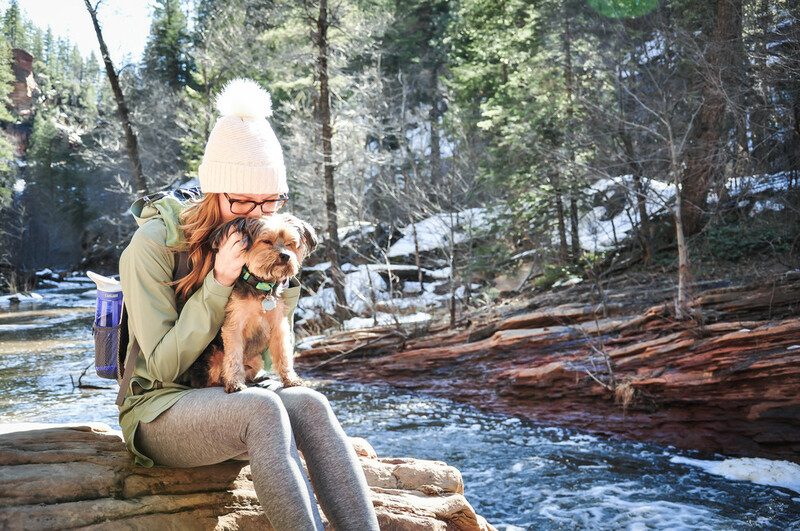 One of our favorite hikes in the state and a place that's particularly special for us is the West Fork Oak Creek trail in Sedona. It's arguably the most popular hike in Sedona, and there's a reason for that - it's one of the few easily accessible hikes in the state that includes a creek that flows year round and runs alongside the entirety of the hike, and the easy-to-tackle trail winds through a deep forested canyon with plenty of Sedona's famously stunning rock formations towering all around you. Of course this beauty of a hike is jam-packed in the summer when the water's low and crossing the creek is easy breezy, but our trick is to hit West Fork in the winter, when there's still plenty of gorgeous scenery and fresh air to take in, but crossing the creek is a little bit trickier with rising water levels, deterring the masses from taking over every inch of the trail. We absolutely love walking this trail, and there's just a certain magic in the air on this hike in the winter. It's so peaceful and serene with the sound of the flowing creek following you, and was perfect for snagging that last little bit of winter before the snow disappears until next year. Hamlet's paws were so confused (despite spending some time in the snow, he's still a little skeptical about its intentions and its generally cold demeanor), but as you can see, there just about nothing cuter than a pup with wet paws and fluffy arms! It's so funny how the temperature in different parts of Sedona can vary so drastically. In one part of town it can be 65 and sweat-inducing in the beating sun in the middle of the day, like it was on this day, and then just 20 minutes north on the West Fork trail in the canyon, the snow and ice are still standing and you're throwing on your hat and mittens! Luckily, as you can see from the pics, we each took on the burden of preparing for one of the two climates, so as a couple, we were basically prepared for whatever the weather would bring. ;) That's Arizona for ya! 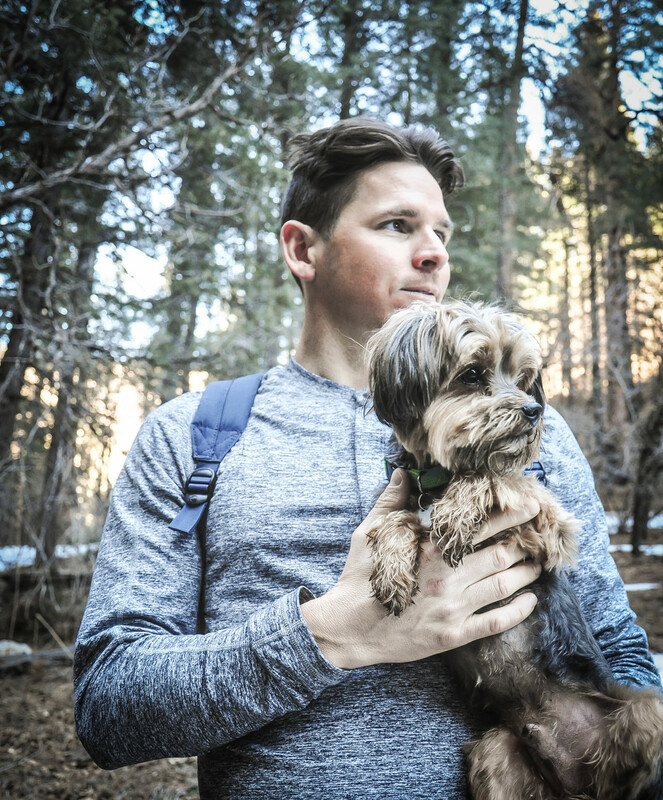 We always seem to find something new and different about the trail every time we hit this hike, and this time I think what we found was that we both have pretty excellent balance! At just about every creek crossing, we saw another person bite the dust and take an unexpected dip in the water after falling off of the not-so-stable tree trunk bridges that connect you to the next part of the path. Not us, though! Nope - we were like the Flying Wallendas on there, mastering the art of deep breathing, prayer and clutching our trusty yorkie poo for balance. It was a thing of beauty! There has been a lot going on at the Miller-Carter household as of late, and we can't wait to share what we've been up to with you in the coming months. This year has already been one wild ride, from new adventures to new house projects, we're really kicking it into high gear while we enjoy this amazing year of being engaged. So stay tuned for more and more fun updates and a whole lotta snaps from life lately! PS - are you following us on Pinterest? We've been pinning like crazy lately, so follow along and see some sneak peeks of what we're up to on the wedding planning front!